Getting married at Royal Holloway? Having a civil ceremony? If you are considering getting married at Royal Holloway, and holding a civil wedding ceremony, both the Founders Dining Hall and the Picture Gallery have recently been granted civil ceremony license. So for those who prefer a civil rather than religious ceremony, or for couples who would not previously have had access to a wedding in the chapel (only available to RH students and alumni) it opens up a whole new ream of exciting possibilities, making this gorgeous venue suitable to more lucky couples. Great news if you are considering getting married at Royal Holloway or have already booked your wedding there! But with exciting new options also come a few question marks… The rooms are stunning, light and airy but rather huge, able to accommodate very large weddings – in itself a great bonus as it is hard to find wedding venues with so much character, which can also cater to big numbers. But with this scale, you may also be a little daunted on how to dress such amazingly large rooms for your wedding ceremony. Quite possibly, you may wish to visualise how they may look dressed for a wedding ceremony. 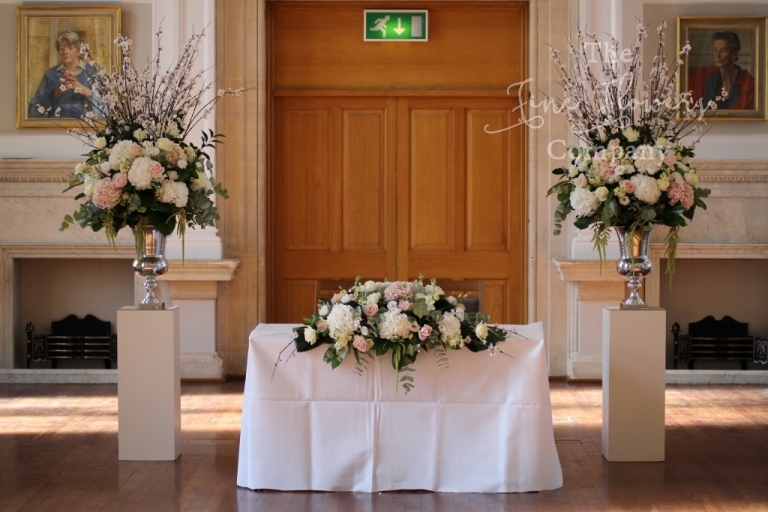 As recommended florists at Royal Holloway we were priviledged to be asked to dress the rooms for a photoshoot, to showcase how amazing the venue can look for a civil ceremony. Here are some of the photos from the day, to give you inspiration for your wedding at Royal Holloway. 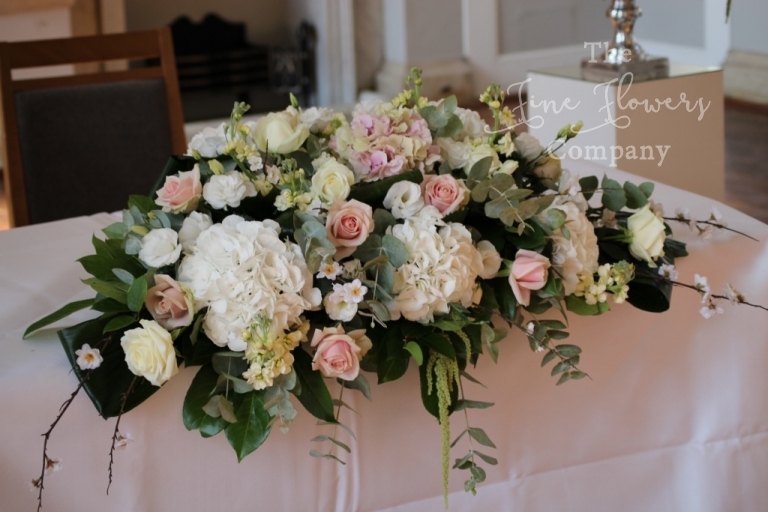 We created two amazing urn centrepieces to frame the all important, all-eyes-on-you ceremony area, and dressed the ceremony table with a lovely flowers centrepiece which could also be used on the top table afterwards. We used a line up of tall displays to flank the aisle bring the focus back towards the wedding aisle and make the space look more cosy and romantic. This look was perfect for a spring /early summer wedding but you can imagine how the cherry blossom twigs could be replaced by sparkly winter twigs for a frosty winter wonderland themed wedding. Or the vases could have tall delphiniums in them for a gorgeous summer wedding, or tall twisted willow twigs for a rustic or autumnal wedding… This is a really verstile look which works because it gives the large room a strong focal aisle, bring the attention back towards the middle of the room, rather than allowing the huge scale of the hall to dominate, distract and overwhelm. 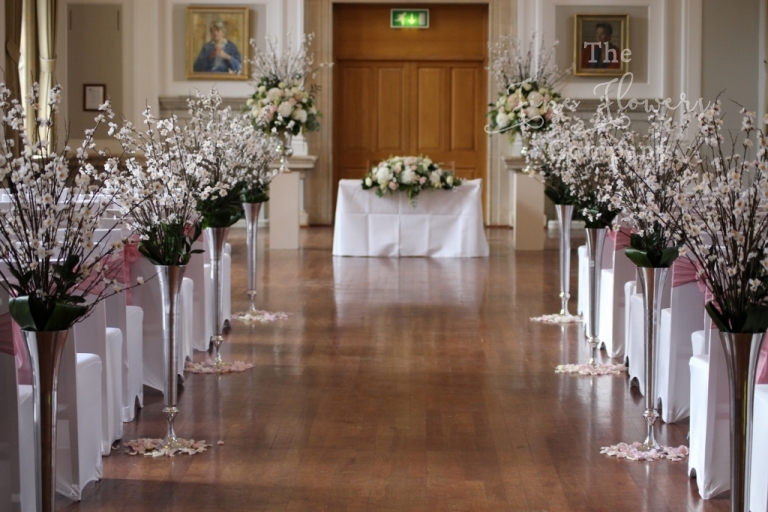 We are recommended florists at Royal Holloway and have lots of experience on how to dress the venue to make the most of its lovely features. 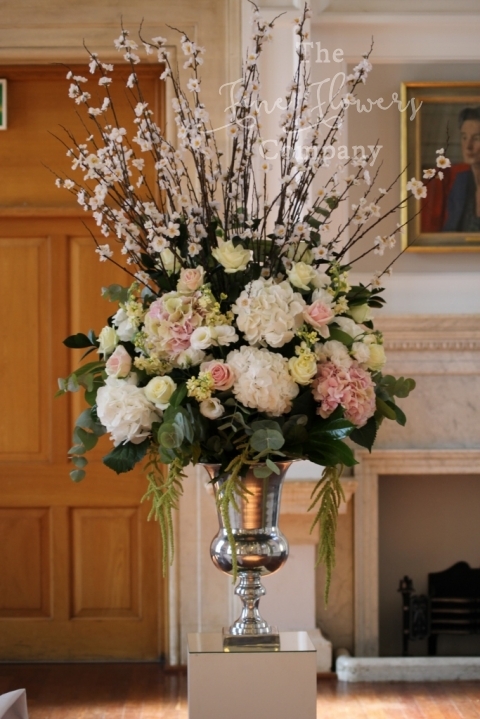 For more ideas for weddings at Royal Holloway please visit our Royal Holloway wedding flowers pages.